In 2014, Beneteau revolutionized the standards of outboard design with its Flyer range, paving the way for unprecedented habitability and comfort. Williams Jet Tenders has revealed it will be re-launching two of its iconic Turbojet models at this year’s Cannes Yachting Festival and for the first time at the show. With more than 50 years of experience in building fast, folding trimarans, Dragonfly now introduces 2 new members of the Dragonfly family. After “Quantum of Solace” and “Diamonds Are Forever”, “Spectre” is the third yacht launched by Benetti for talented New York businessman John Staluppi. Ferretti Yachts 670 is the shipyard's first gift to itself - and the rest of the nautical world - as the brand celebrates its 50th Anniversary in 2018. 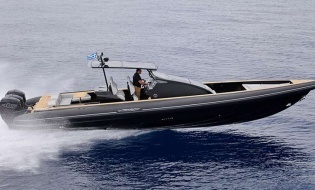 ARCADIA YACHTS is delighted to announce that a new unit of the ARCADIA A105 has been delivered to her Owner, just over an year after the model has been presented.